Make Me Dress Stupid(er) at PASS Summit! There’s a little more than a month to go until two momentous occasions are upon us: PASS Summit, and the deadline for Argenis Without Borders 2.0! 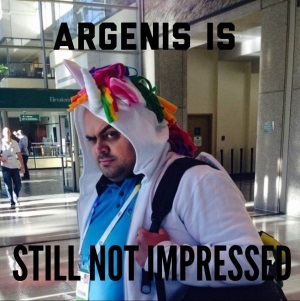 If you’re not familiar with last year’s incarnation, Argenis Without Borders started as an office dare by Kirsten Benzel and ended up being an awesome campaign for Doctors Without Borders where Argenis Fernandez promised to wear a unicorn hoodie (see photographic evidence below) and others agreed to wear costumes and perform various humorous acts as different fundraising milestones were met. It was a tremendous success! Maybe reaching our goal will help impress him! This year even more people, including myself, have joined in on the fun. 16 of us have agreed to wear costumes or awesome hats if we hit the $5000 mark. Only problem is, we haven’t reached that goal yet. The good news is that there’s still more than a month left; donations are being accepted until October 27. 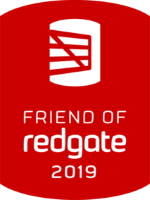 It’s for an amazing cause, and we all know how generous #sqlfamily can be. So if you’d like to see me and 15 others wearing something completely off-the-wall, please donate here! UPDATE: We’ve now hit the $5,000 mark. Great job, everyone! Guess I’ll have to figure out a costume after all!